It was an action packed week and here, after much nagging from family members, is our MEGA HUGE Quebec trip wrap up! If you start reading it early enough you may still have time to Ski-Doo! On Wednesday we took the boys to visit their great grandfather again. The guys had a great time there. 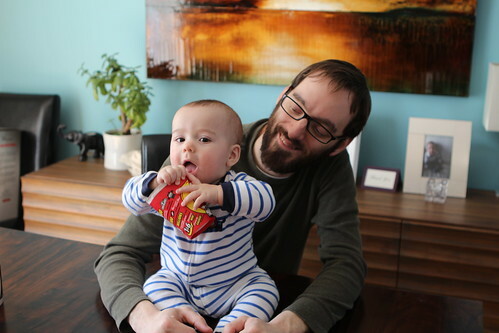 Martin, whose new favorite thing is to bite people's chins and noses, was quite surprised when he attempted to do this to his great grandfather who bit him right back. No one had ever done this to Martin before and you could see the betrayal in his eyes. 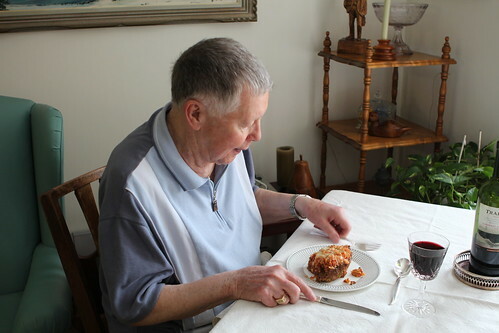 Grandpa made us a delicious lunch of avocado soup, Caesar salad, and country pie with a nice bottle of red wine continuing our beer-and-wine fueled vacation. Tuck Shop in Montreal. It snowed about 75% of the time we were in Quebec and that night was the worst of it with a rather rough commute in and out of the city. As messy as it was it made for a very appropriate seasonal backdrop and reminded us of our favorite Montreal-based show, Show Me Yours which we used to watch regularly for reasons unknown. We've probably seen the show two dozen times yet, strangely, always the same three episodes. 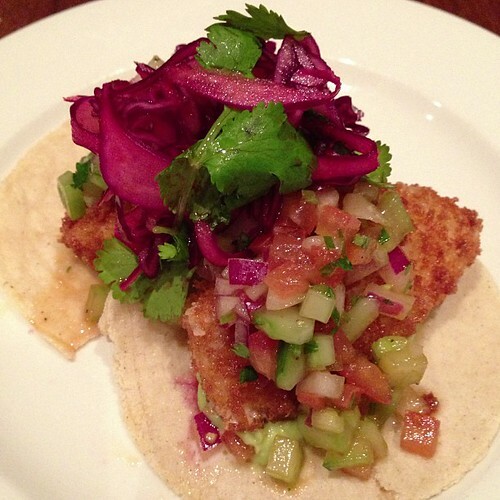 To start we had the crispy buffalo mozzarella tacos. 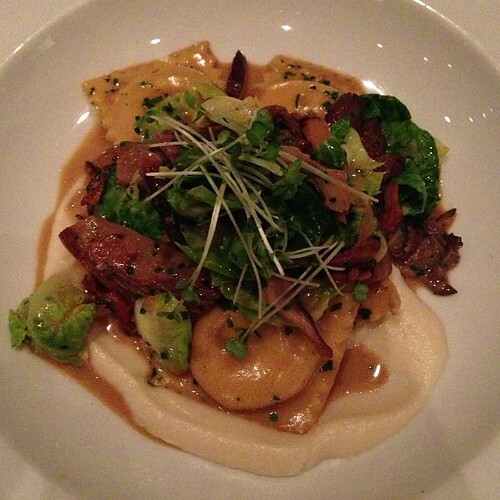 Jen had the lobster ravioli. 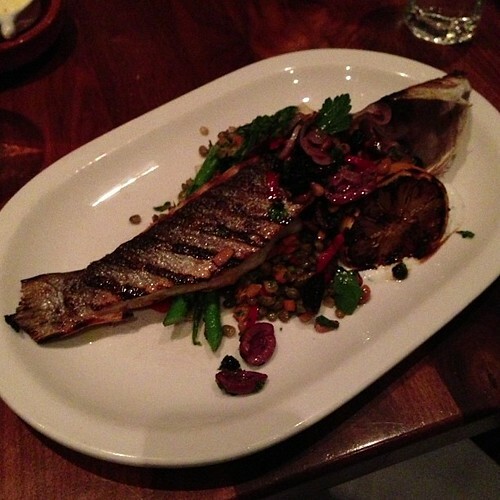 I had the grilled whole sea bass which was not only delicious but they seemed to have expertly removed all the tiny bones in the fish which made the normal landmine-filled experience of whole fish-eating even that more enjoyable. 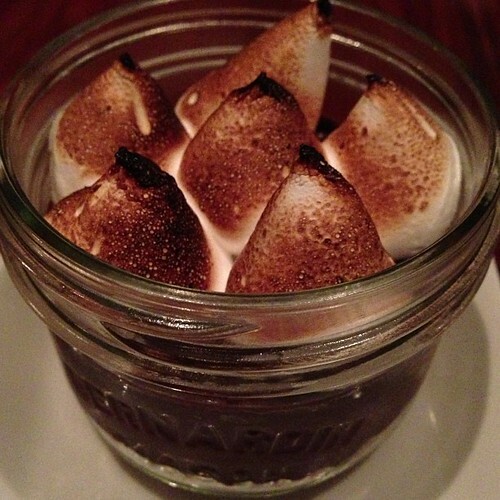 For dessert we had this tasty little s'more in a jar which was actually a graham cracker crust with a thick layer of ganache and topped with torched marshmallows. 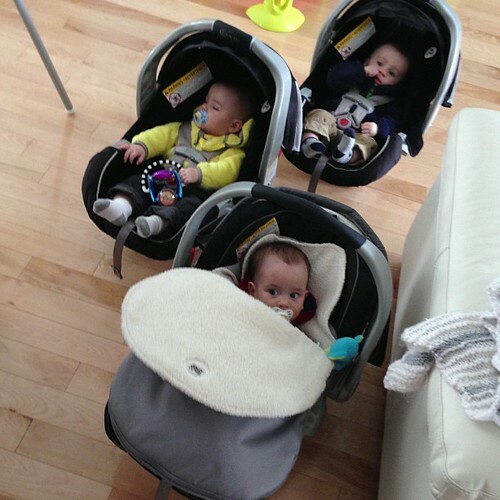 After another messy drive home we returned to two babies who reportedly went to sleep with virtually no effort. Apparently our boys know to be on their best behavior when being watched by others and save up their fuss-a-thons for mummy and daddy. 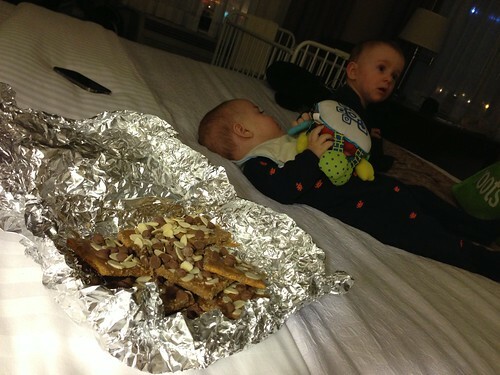 We are now going to leave them with others to get ready for bed while we go out wining and dining on a regular basis. Thursday Jen and Anne-Marie brought the babies to baby yoga. As a super macho man I did something more manly and joined Jen's grandpa for drinks at the local watering hole. 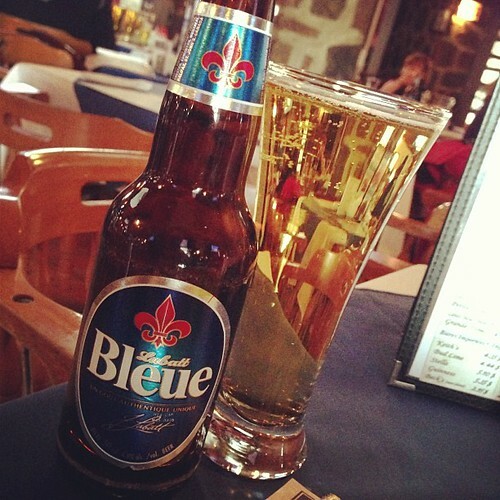 I hadn't had a Labatt Bleue in a good long while. It seemed an appropriate accompaniment to chatting with grandpa about a wide variety of topics and watching the Montreal Canadiens beaten the Toronto Maple Leafs 5 to 2. Since I was in enemy territory I pretended that this did not bother me. We were able to get babysitters for a second night as we headed back into the city to meet Jen's father's old college roommate for a few beers at his local pub. 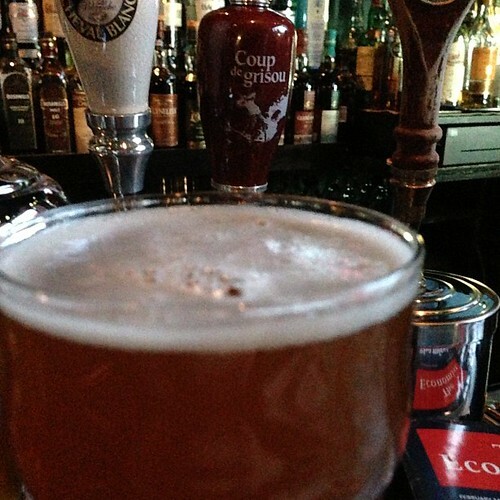 We had what may have been one of the top beer highlights of the trip, Coup de Grisou. Yes, it was even better than Labatt Bleue. After a stop off in the local fish shop we headed home where I enjoyed another of my fine purchases, this oatmeal stout, and cooked up some nice seafood for dinner. 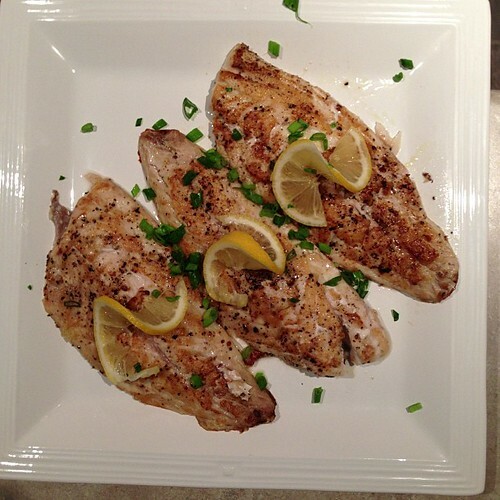 I pan seared these red snapper fillets and topped them with fresh lemon and green onion. 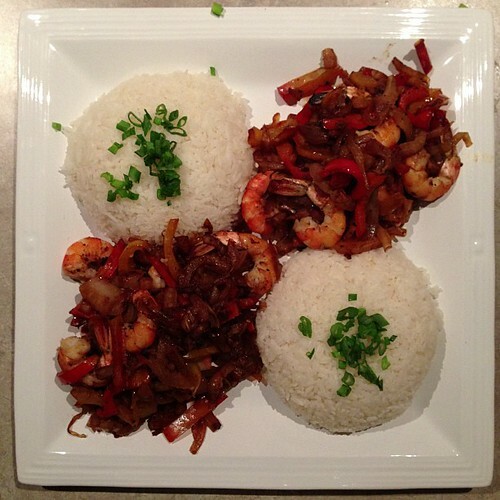 I also stewed some onion, garlic, fennel, peppers, and shrimp and served them up with sticky rice made by Anne-Marie for a nice late night fish feast. 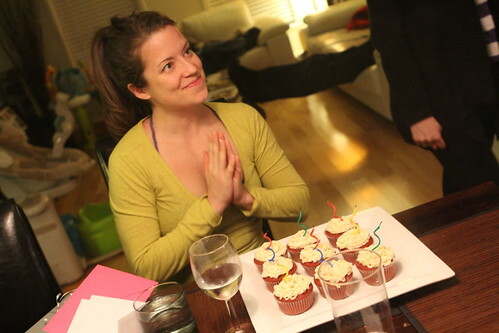 Friday was Anne-Marie's birthday and, unfortunately, the babies were not in great shape the night before. Perhaps it was the resentment at being left with family two nights in a row but our guys were decidedly noisy all night. 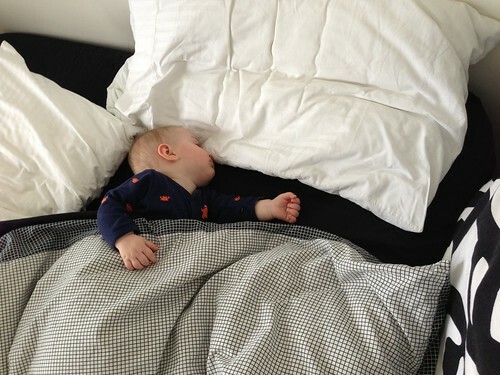 Their cousin was also extremely unwilling to sleep quietly. Maybe it was the fact that his two cousins had invaded his home for the past week. Maybe it was that they'd given him their terrible, perpetual day care cold. At any rate there was little sleep had by anyone leading into Friday morning. After a long night the boys were being so loud and disruptive in the morning that we left the house with them and took them on a little drive in order to try to get our hosts a little quiet and, hopefully, sleep. Jen suggested we return to Le Gobelet, an idea that I found to be quite brilliant. After a trip to the grocery store and Tim Horton's for a donut and coffee we returned to my favorite beer store in North America and returned home with yet another frivolous purchase. 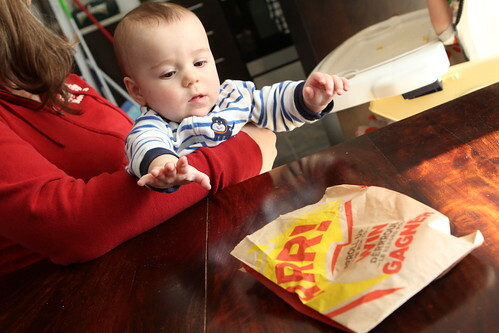 Jen was kind enough to leave me the last bite of her maple dip donut but she spent much of the remainder of the morning trying to keep Elliott from getting to it first. Maple donuts are nearly impossible to find in New York so we need to resort to trips back to Rhode Island or Canada to get our hands on them. 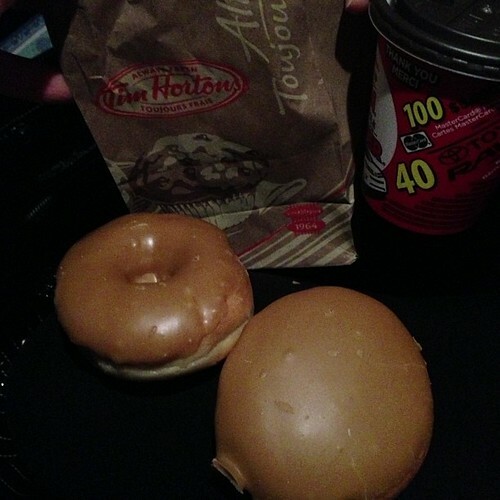 When I ordered a maple donut they asked if I wanted a Canadian Maple or a Maple Dip. We got the Maple Dip and when I learned that the Canadian Maple was actually just a Boston Cream (my personal favorite) with maple replacing the chocolate I knew that we would be returning to Tim Horton's before our trip was over. On this trip Elliott discovered that one of his favorite new activities was to destroy an empty Tim Horton's coffee cup. Here he is ripping his second cup to shreds. Once everyone was ready we packed up all the babies to head out to the market. It came out at dinner the previous night that Anne-Marie was a bit partial to seafood. Since it was her birthday we made plans to head out to the market and get some supplies to make a seafood dinner in honor of her day of birth. 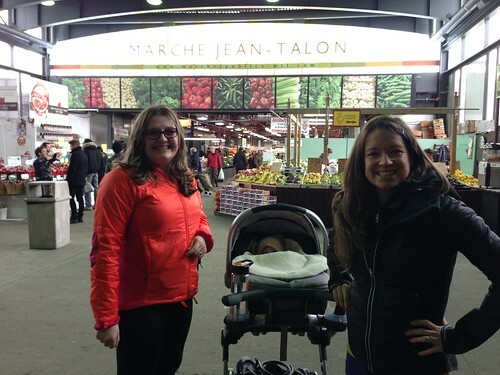 We headed out to Marche Jean-Talon where we spent a few hours exploring, having an extremely challenging lunch with three babies, and shopping for supplies. We returned home to discover we were locked out and made the most of the time by picking up the few remaining items needed at the local supermarket. After looking over what we had it was determined that we would make The Feast of the Seven Fishes, or La Fête Des Sept Poissons. While the feast took place a couple of months later than it is supposed to and it was not entirely Italian in design we did stay true to the Italian-American tradition of stretching and counting shellfish, mollusks, and basically anything from the sea as a a fish. 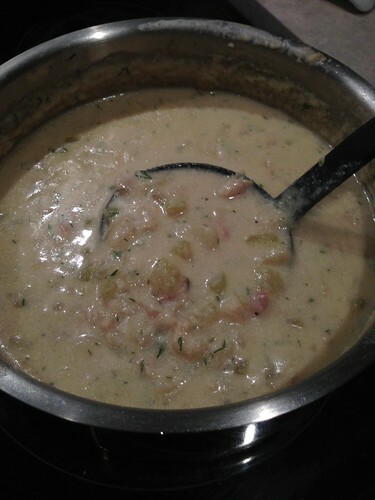 For dinner the first course was New England style clam chowder. 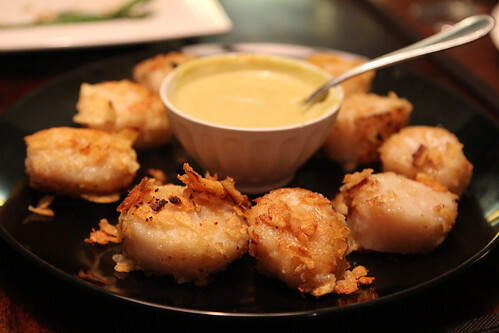 Second up were some beautiful sea scallops which I crusted in crushed potato chips and served with wasabi mayonnaise. 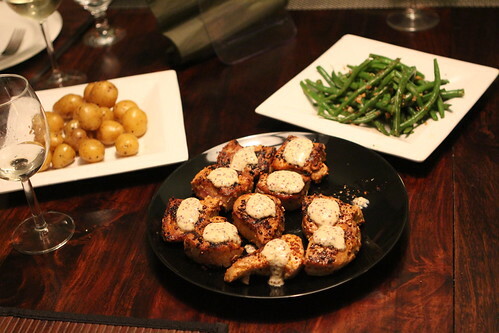 Third course was blackened tuna with a pepper garlic rub and a creamy whole grain mustard sauce. 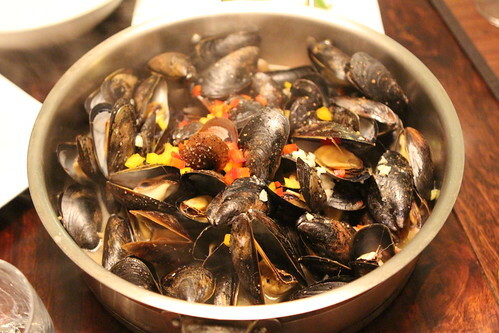 Fourth up was mussels cooked in bacon, onion, celery, butter, and a bottle of Saratoga IPA. 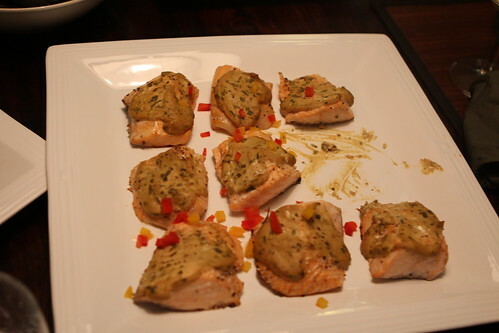 The fifth entry was Atlantic salmon roasted with tarragon mustard. 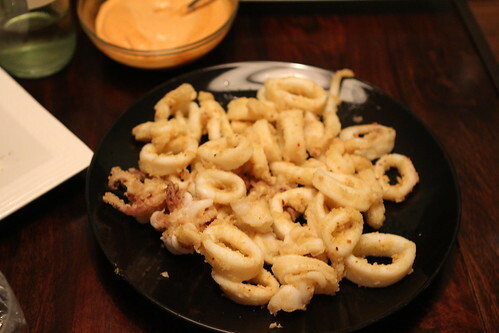 Sixth was fried calamari rings with a spicy pimiento aioli. 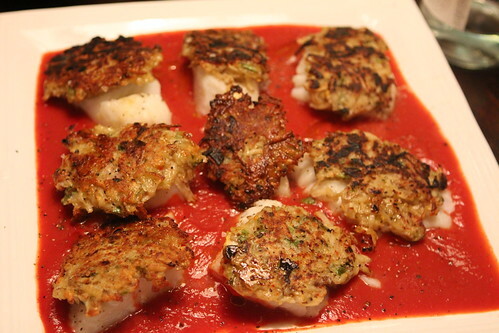 The seventh, and final, course was cod loin with potato crust pan roasted and served with tomato reduction. For dessert we had delicious red velvet brownies made by Anne-Marie's sister Marilou. And all that with nary an interruption by sleeping babies. We have some pretty well-behaved kids. In the morning I was working on quite a sleep deficit and the guys weren't really interested in letting me sleep much past 6:30PM. Martin alternated between sleeping in the bed with us and staying in the bassinette holding pen set up beside the bed. In the morning he chose to practice his new favorite thing was to make super-loud guttural grunting noises. Before Jen and Anne-Marie went shopping for clothes and I opted to get a much-needed nap before the drive home later that night. Martin joined me and he had an unprecedented two hour morning nap while I enjoyed about an hour of that before leaving him alone to sleep off his early morning grunting session. After everyone was awake the ladies went out for another round of shopping while the guys stayed back and watched the babies. We watched as the cousins played together. 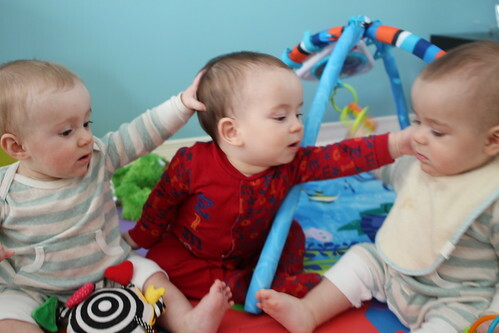 We watched as Jackson lunged in for what looked like another hug of his favorite cousin, Elliott. 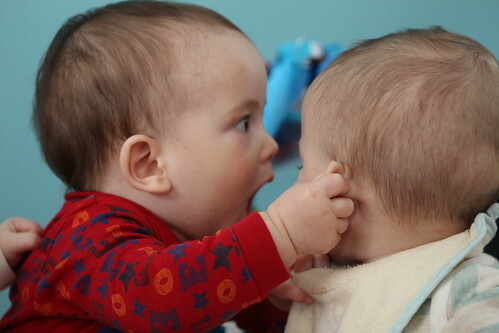 And we watched as Jackson let out a primal scream and attempted to rip Elliott's ear off of his head with his bare hands. After lunch we took the boys back for one final visit with their grand grandpa who was delighted to see them again. 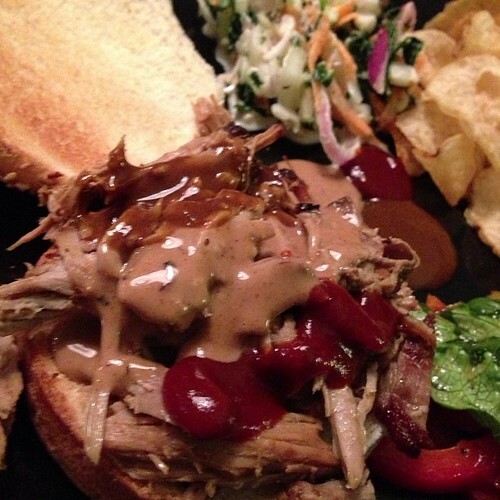 For our last dinner in Quebec I kept my promise of making pulled pork for Jen's cousin Marilou. Anne-Marie was nice enough to make three different barbecue sauces which I sampled at once on my sandwich. After our goodbyes we stopped by Tim Horton's for that Canadian Maple and Maple Dip donut, a coffee for Jen, and what ended up being a perilous journey home. There's about an hour of road between Montreal and the border, and another hour between the border and any semblance of American civilization that is extremely dark and boring. 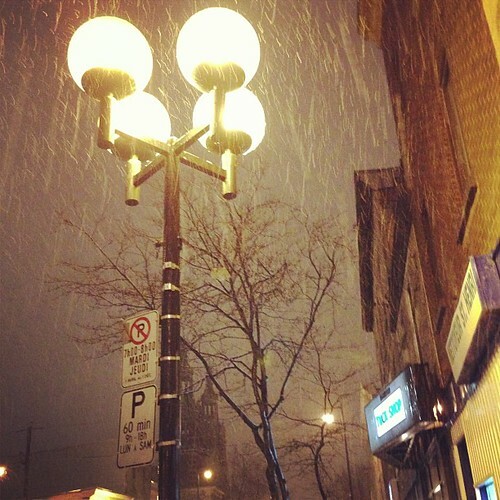 This night, however, we got caught in a blinding snowstorm. At the border the agent asked us a number of questions including about what we were bringing back. I answered honestly when I said, "Some beer." This was a true statement as there was still some beer left in Quebec that I had not purchased. He then asked us a lot of weird questions as they usually do. This time he asked us what lox was. He said he'd always wondered what lox was. I always wonder what game they are playing when they do weird things like this. Since we were from New York he must have wanted to test us to see if we knew our stuff. How could he possibly not know what lox was? And if he really wanted to know that badly couldn't he have Googled it? After that exchange, and thanks to my lack of sleep the night before, I became dangerously sleepy to the point that we decided to pull off the highway to get some gas and give Jen a turn driving. What we didn't count on was the gas station advertised on the highway sign being thirty minutes off the highway. That was thirty minute off the highway in blinding, hypnotizing snow conditions. After we finally reached this gas station -- which neither of us actually believed existed -- I spent most of the time leaning backwards trying to feed a shrieking Martin a bottle while sitting in the darkness of the gas station's parking lot. We arrived Saratoga Springs after 1:00 AM. 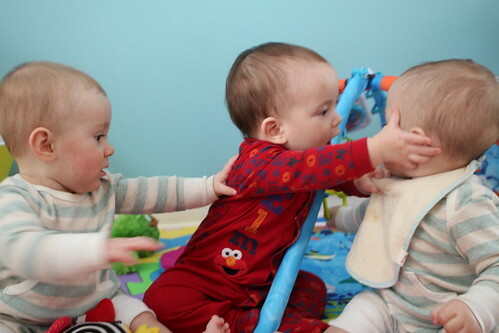 The babies were delighted to arrive and considered this to be time for an early morning yelling session. Luckily we had these biscuits de maman made by Anne-Marie to eat while attempting to calm the babies and get them to bed. After about five or six hours of sleep we woke up and got the babies downstairs to breakfast at yet another Holiday Inn in their short lives. Since there was no Hurricane tearing through this was a slightly better experience, however, there was some sort of huge breakfast function going on so we did experience an excessively long wait for our breakfast. The babies kept us busy enough that we didn't notice much. 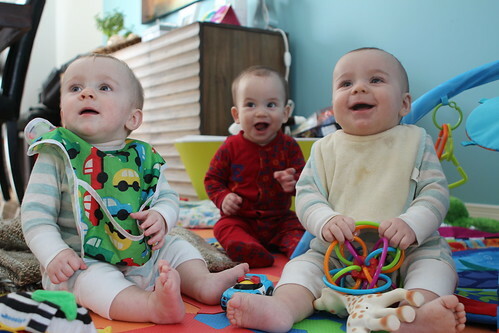 We were also visited by all maner of strangers who wanted to admire the babies and ask us questions about them. That is the risk of taking these guys anywhere. 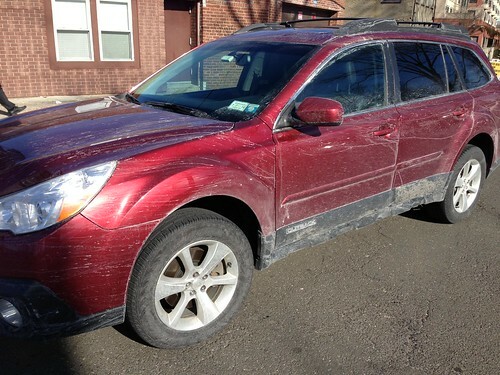 When we got home the car was showing the signs of a week where it snowed the vast majority of the time. 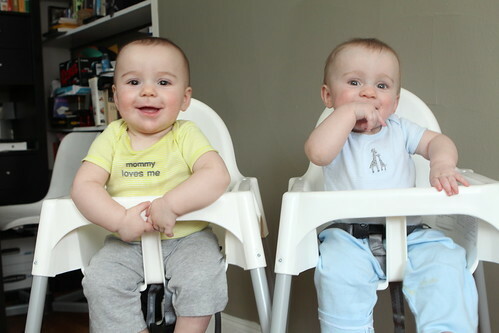 Blocking the door to our apartment was the Ikea high chairs I'd ordered so I got to work quickly to put them together so we could feed them their first dinner at home in their high chairs. 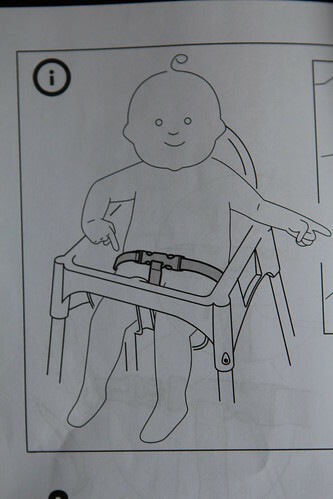 Thankfully they looked a bit cuter than the terrifying baby-monster in the Ikea high chair instruction booklet. 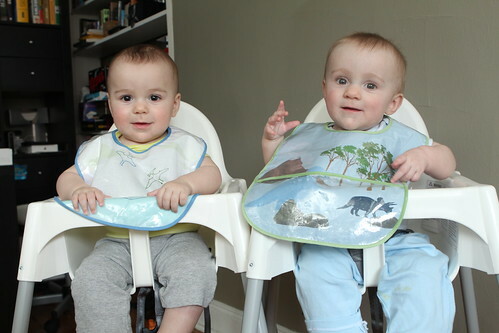 Jen put on their new dinosaur bibs. 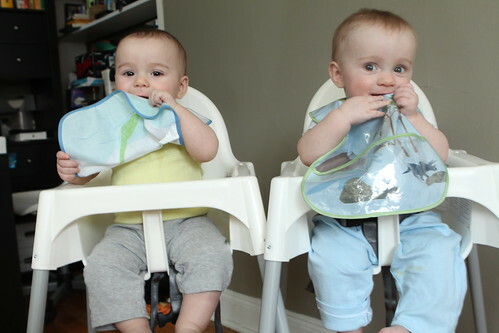 And they immediately tried to eat their new dinosaur bibs. 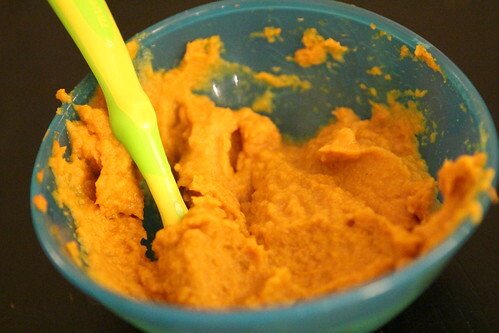 Jen whipped up some pumpkin for the boys which they seemed to enjoy. Unfortunately Martin enjoyed chewing on the strap to his high chair even more. 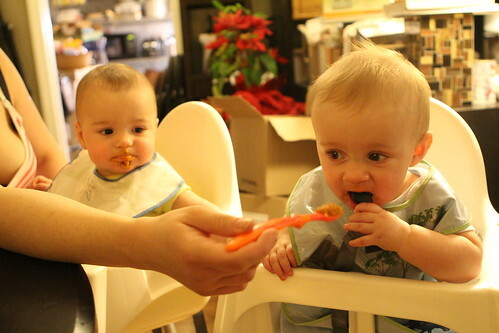 After dinner the boys took their first bath without the aid of any plastic contraptions. 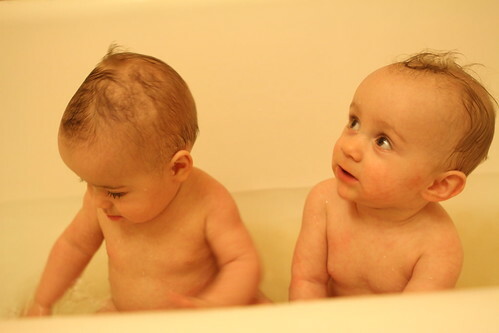 They seemed to like this a hundred times more than their normal bath because they got to play, splash, and attempt to knock each other over. I took about four hundred photos of Martin trying to capture his first tooth which came in during our trip. Sadly this is the best one I could get. While it is difficult to see it is extremely easy to feel when he bites my finger since he is now able to draw blood. Jen is less lucky since he enjoys biting her chin. He's not interested in biting my chin but he has become increasingly dangerous to my beard and this requires me to trim on a much more regular basis for fear that he will bring me to tears but pulling at my beard hairs with all his tiny and terrible might. 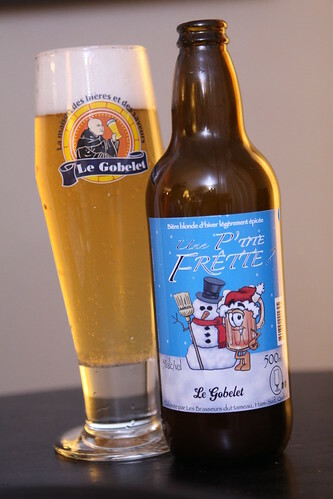 After getting the guys to bed we enjoyed some Italian take out and I cracked open another fine Quebec beer, this P'tite Frette, brewed by the owners of Le Gobelet. I have been pleasantly surprised by their line of beers so far. 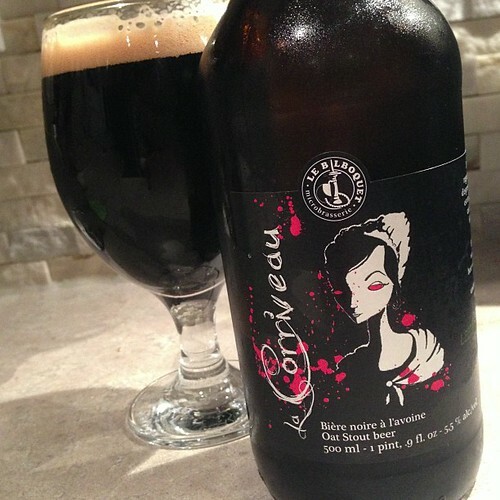 While this was unlike any winter beer I've had before it was a delicious and refreshing beer, light and spicy. It was a fantastic week spent with family but it's a bit sad to think that the boys will not remember it. Partly this is good because they won't have to think about that time we fed them parsnips and all three of them hated it for some unknown reason. Also they won't have to remember how bored they were waiting for their father to finish up his exploration of Quebec beer stores. Get ready, guys. Your father is going to bore you to tears. Something for everyone, babies, beer and food. Looks like you had a wonderful time. Indeed it was a smashing good time.